Easter Activities for Kids. 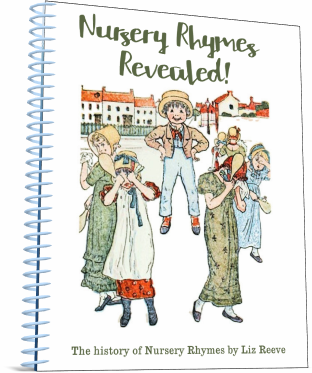 Some exciting teaching ideas for kindergarten kids. Easter is an important occasion in the Christian year. 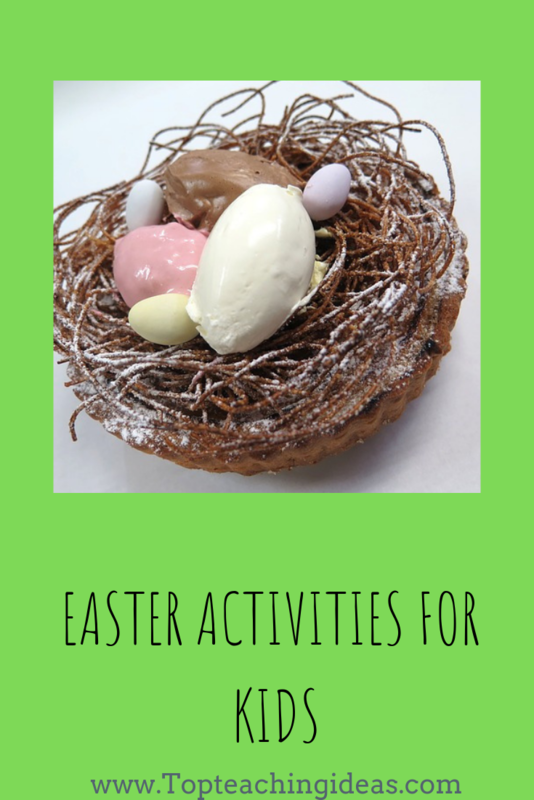 I hope you find some of these Easter activities for kids fun to try with your students. This is one of my favourite Easter activities for kids because the children can participate with the preparation. Always handy to have some willing little 'people' to help with the setting up! And while they are engaged in this, they are, of course, communicating with you, following instructions and learning to work as a team! Firstly, you will have needed to have collected some clean empty egg shells.It honestly doesn't take long if you ask classroom assistants and colleagues to help. a fairly deep tray for the kids to crush up the shells in. some bottles of food colouring. The more you have the brighter the collage will be. access to a heat source for drying the coloured eggshells. a piece of paper for each child. pens to draw the outlines. Meanwhile, it might be good for you to take the food colouring and tip a small amount of each colour into the bowls or pots. Ask them what colours you have got! When they have finished crushing, get them to put some of the eggshells in each bowl and mix them around with a paintbrush. Leave for as long as you can. Overnight if possible. Then drain them in a sieve and put in a low oven to dry. If you don't have access to an oven you can use a radiator. While all this is going on, you can get the kids to draw an Easter outline on their piece of paper. Something like an Easter Bunny or an Easter Egg. Then when all is dry and cool, they make their Easter Collage by sticking the eggshells onto their paper. You can also make this activity more arbitrary by getting the kids to stick the eggshells anywhere on their paper making it look more like a mosaic. One of the simplest Easter activities for kids to enjoy! 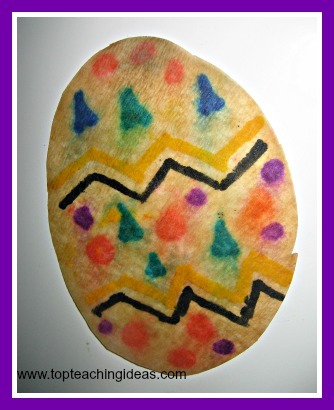 These eggs can be used for Easter cards or for a colourful classroom display. All you need to do, and the kids can do this, is to draw and cut out a simple outline of an Easter Egg from coffee filter paper. Then, using felt tip pens, the kids draw a design on their egg. When they have finished, they lightly dip the eggs into a tray of water. Watch the colours run into one another!! Bingo! A super easy card for mum! This is one of the easiest Easter Activities for Kids to do. Why not try an Easter bunny or an Easter chick using the same method? You will need to source a piece of acrylic. The larger the size the better as then you can have 2 children working side by side. You will also need a set of window drawing pens. Available from the web or from a good craft store. 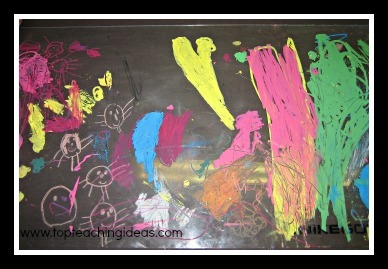 Just ask the kids to draw some Easter pictures on the 'glass' and take some photos and stick them in their journal! Job done! The Easter story is a sensitive topic to address with very small children. It is however important that they get to know a little about it.So what better way than making the garden in which Jesus was found walking in after his resurrection. It is up to you to decide whether you want to include the hill in the background where the crucifixion took place in which case you can include the 3 crosses. I think it does depend on the age of the children in your class and whether they know the Easter story. I personally have left that bit out until they are older and can address the sensitive issue of death. This activity can be carried out individually or as a group session if you prefer. A large tray or tuff tray for creating the garden in. If the kids are doing individual ones you will need a cereal box cut in half length ways and some cling film to make it water proof. sand or soil to landscape the garden! a collection of items from around the school grounds such as moss, leaves, flowers, twigs,stones and anything else that they see that they think might go into the garden. Plastic bags for their collections to go into. Before getting the kids involved you might like to do the ground work and put some wet sand into the tray or trays ready for kids to landscape their gardens. On a sunny day, take the kids out into the school grounds and ask them to collect some objects that they would like to put into their Easter garden. Give them some ideas at this point so they don't go collecting totally unsuitable items! Might be good to ask them if they can name the items too. Next back in the classroom. 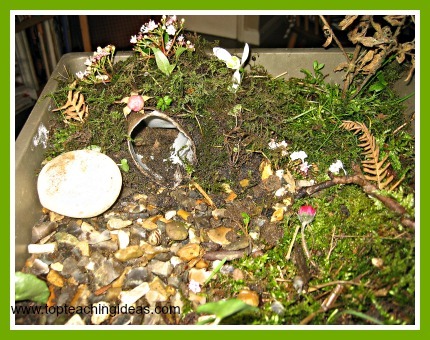 the kids can mould the sand into little hills and valleys ready to put the moss or grass onto the top. Then, it really is a good idea to allow them to come up with their own ideas . That way you wont get a class full of identical gardens. Perhaps you could give them the idea of cutting the paper roll up, wrapping it in clingfilm before burying it in the sand and putting a stone in front. Lastly you can add the people to the garden. 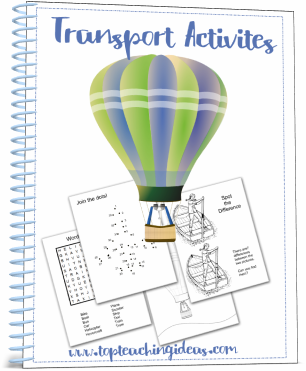 Go to Topteachingideas Home from Easter Activities for Kids.